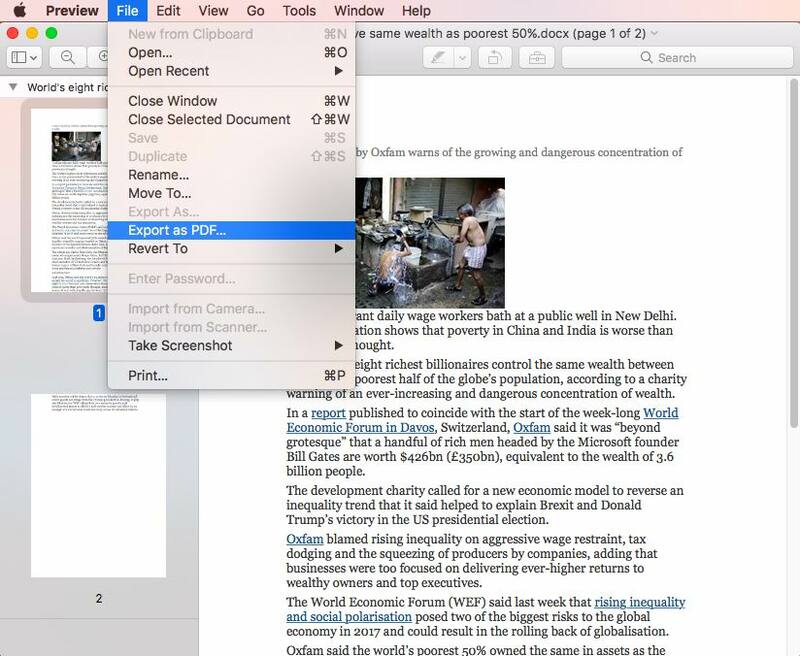 How to Convert Word to PDF on Mac with High Quality Preserved? Microsoft Word is the most widely used commercial word processor, but there are great chances you may have to make it in PDF format for printing or distribution, as PDF is more portable and much easy to access. There are several ways to convert word to PDF on Mac, also in this post, we will talk about the best-quality way to convert Word to PDF on mac. Formatting and image resolution are always the most common issues confronted in the process of Word-PDF conversion. Dedicated to shoot all these quality concerns, professional 3rd party software become a preferred solution for mac users to create PDF with high quality. 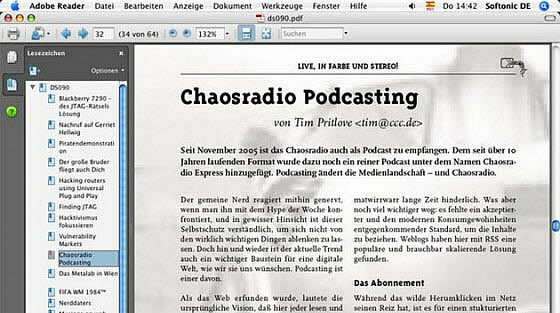 Like Cisdem PDFCreator for Mac , is one of the best PDFCreator designed to create PDFs out from Word,from PowerPoint,from EPUB, Text, RTFD, HTML, CHM and Image files, with original high quality(nice formatting, high image resolution) preserved. 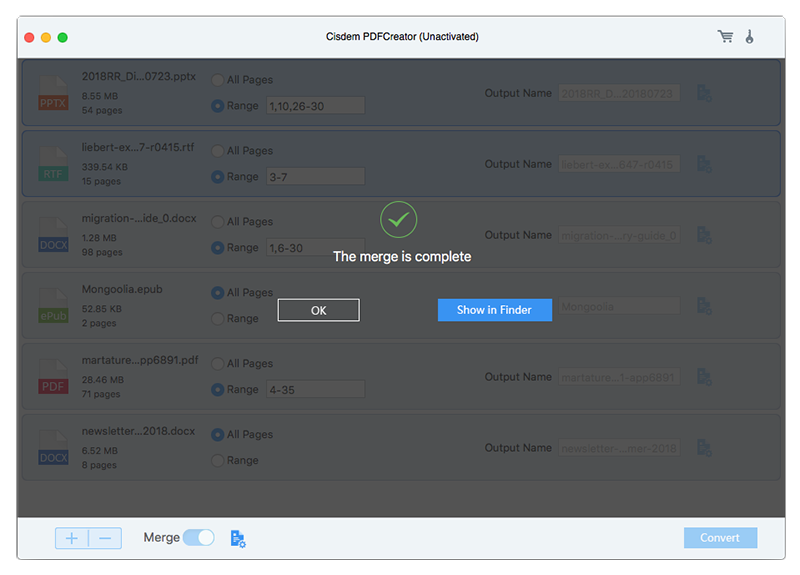 With this tool, you can create PDF(s) from single or even multiple file(s) in same or in different formats, for example, you can create single or different PDF(s) from one Word or multiple Word, or even merge all files in different formats into one PDF. 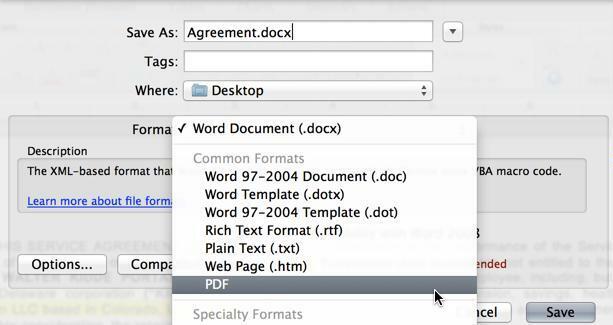 Once you have installed PDFCreator on your mac, launch it and import Word to the program by drag&drop, or direcly clicking “+”.You can upload multiple Word files into the program, even those large-size ones. Select all pages or page range as needed. Click on the Word icon to preview the file and fill the page range.You can also change the output name for each file. Once all the files are ready in the program, click "Convert"to change Word to PDF. Remember to turn the "Merge " feature ON if you want to combine all the Word files into single one PDF. If you have worked with Microsoft Word for a quite while, Word-to-PDF conversion would be quite easy, just save the Word file as PDF on your mac. But keep this in your mind, Microsoft Office and Adobe use different ways to decode files, which means the PDF file will look a little different once the Word is saved as PDF. Multiple solutions help users to convert any PDFs, native/scanned/protected ones to editable Word, with original file quality highly retained, such as text formatting, layout, graphs, table, etc. Install Adobe Reader. Include the option to install the Adobe PDF printer. Open your document in word and go to File choose Page Setup. Close Distiller when conversion is complete. The new PDF document may open in Acrobat automatically or you may have to open the document yourself. As a mac user, you should be quite familiar with Preview, the image viewer and PDF viewer coming within the MacOS. In addition to these, Preview can also open iWork and Office files. Of course, there are more choices, such as online free tools(you can search results with Google). But if you want a good user experience and high quality, I do believe the PDFCreator will be your best options, it is paid but affordable, capable of boosting your efficiency on paperwork. How to Save WebPage as PDF on Mac with Safari, Chrome, Firefox and more? Wouldn’t it be nice if you could magically turn the web pages you want to save or share with your client while email into PDF files? But many users don’t know how to save WebPage as PDF on Mac. Here we’ll show you three methods to do so. All of them are very easy. Follow the steps below and you will master quickly. How to Create Multi-Page PDF File on Mac without Adobe Acrobat? As the most common file format, PDF is widely used in work and life since it can be converted to a varity of other file format directly, and it also can be used in all oparating systems, including Mac, Windows, etc. 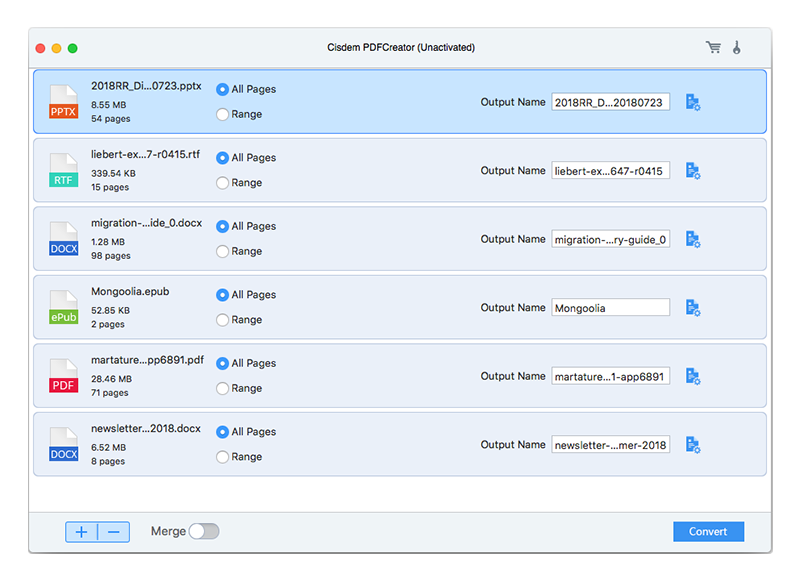 Now that PDF file is so practical, for Mac users, how to make a PDF on Mac is a question. 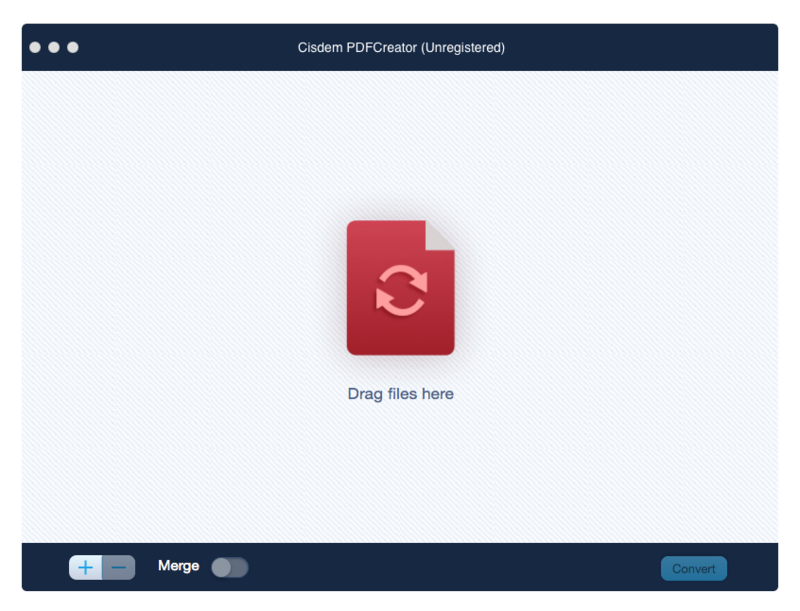 Actually, creat PDF files on Mac isn't all that complicated. PDF files can be opened on any operating system, but word file cannot, so we need to convert word to PDF file so that we can share it more conveniently. There are 3 ways will be provided for each Mac user, you can read this article to know how to convert word to PDF on Mac. My customers sent me files with all kinds of formats, I need to keep records in PDF, it's good to have so great tool for my job. 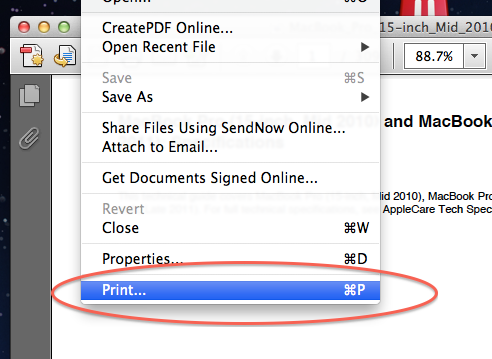 How to Unlock a PDF on Mac No Matter You Know or Forgot the Password? Sign up for Cisdem newsletters, stay informed on the latest products news, the hottest deals, and our holiday special sales.